It was the moment the crowd had been waiting for: the answer to race director Craig Thornley’s question, “How Long is Your Waldo?,” referring to the actual length of the Where’s Waldo 100 km course. The answer was brought into the prerace meeting in a briefcase handcuffed to a runner wearing a blazer, long black wig, and headband, and was pulled out by Oregon’s grandfather of ultrarunning, Clem LaCava. Before sharing the distance with the rest of us, he gave a little laugh and said, “fifty eight. 66.3 miles.” It had been wheeled by Co-RD Curt Ringstad. Between the 3am early start and 5am regular start the next morning 88 headlamps took off past the ski lift of the Willamette Pass ski resort and up towards the beautiful Rosary lakes. The field was mixed with relay and solo runners; the relay hand off is at Charlton Lake, roughly the halfway point at mile 34. I had the privilege of starting this race in a group with Craig, Megan Arbogast, Jeff Browning, and Sean Meissner. Craig explained the ironic naming of these three lakes (Lower, Middle and North) as we meandered up the runnable hills towards the first aid station and eventual climb up Fuji Mountain. This race is known as being a climber’s course with nearly 11,000 feet of gain taking runners to incredible views and gorgeous alpine lakes. To keep things interesting, Craig and Curt put a few incentives on the line. In order to win any of these prizes a runner must complete the race. The first person to the top of Fuji Mountain (mile 16) wins the ‘Find Waldo’ award, which this year was a Patagonia Endurance pack. The person to fully submerge in the most alpine lakes wins the Wet Waldo award, a pair of Vasque shoes. Lewis Taylor charged up Fuji mountain in 2:31 with Hal Koerner and James Hiebert close on his heels. I was still headed up as they all came charging back down. We would get to enjoy two more out and backs to the Twins summit and the final climb up Maiden Peak, allowing us to share hellos and cheers and check in on the rest of the field. The morning hours passed quickly, and before I knew it I was crossing the road into the Mt Ray aid station (mile 22.5) and the first opportunity to see crew. Curt was there and was excited to see me on pace with Kami Semick’s record time from last year. The weather was getting warm; I appreciated the ice shaking around in my bottles as I walked out of the station working on a banana piece. I caught up to Jeff Kozak, who had run the course the year before and informed me that we were on Andy Jones-Wilkins’ pace (men’s course record) from the previous year. Both Jeff and I were looking to break 12 hours, and we talked about the smooth runnable “climbers” course. Beautiful, soft single track, including sections on the Pacific Crest Trail, weaved us around and through the shady forest. Pink ribbons and bright yellow signs marked each intersection. Confidence markers were few, but as long as you kept alert at intersections there was no way you could get lost. The route was marked perfectly. 11 miles later we arrived at Charlton Lake, a great place for crews and aid station workers to hang out. Matt Hart was dressed and ready to pace me to the finish. There were a lot of familiar Oregon ultrarunning faces working the aid station and treating us all too well. Bottles filled and belly topped off with Balanced, we left the aid station with three or four men having already passed through. The second half of the race was just as beautiful with a little bit of terrain diversity. The aid stations were spaced perfectly for about two bottles. 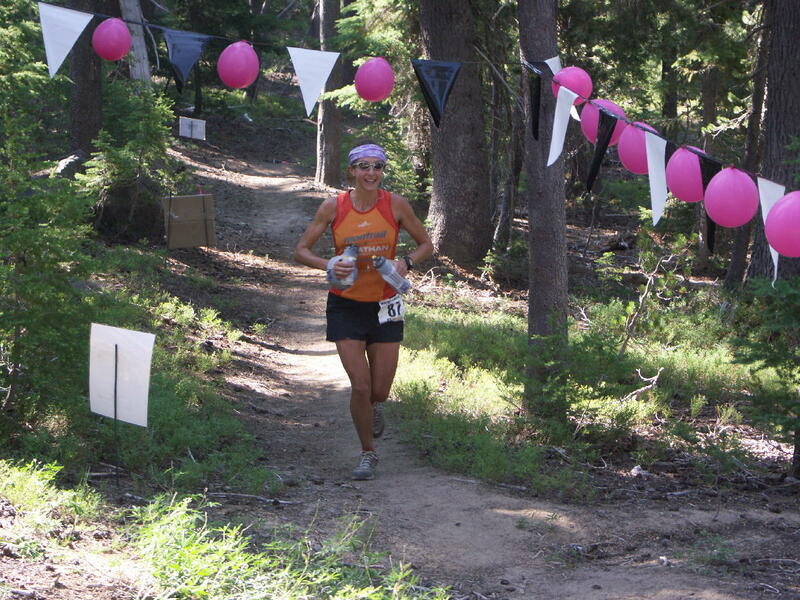 A runner wouldn’t know these aid stations had been hiked in for all the food, ice, and water. Hiking up the Twins we passed Kevin Troyer and then Hal Koerner who could not keep anything in his stomach. Leaving the Maiden Peak aid station, John Pearch shared with Matt that the first place male was a mere three minutes ahead. Matt ran every time the trail flattened out, and I followed. We climbed and climbed eventually spotting Lewis less than a mile from the summit. We hiked past Lewis with his hands on his hips, shared breathless “good job” comments, and kept moving. I kick myself now for not taking in the views from the summit, but then I had a new goal in mind. I took a deep breath, thanked the volunteers for being there, and scooted off the summit and down the hill to John Ticer who confirmed that I was indeed leading the race. He pointed us in the right direction down the most technical section of the course: Leap of Faith, one of the many trails on the course that Where’s Waldo volunteers have resurrected for the sake of the race. Down, down we went arriving at the final aid station where an angel took a baby wipe to my salty face; it’s the little things that make a runner’s day. I found out later that she took it upon herself to wipe down each runner’s face. With only seven rolling miles to the finish, I followed Matt’s lead, and noticed that the only footprints ahead of me were his. My best route finding technique is to watch for familiar tread patterns on the trail. Having only his ahead was something new to me. I slipped into autopilot, and continued to hang on to Matt’s pace. We finally dropped down on the Rosary Lakes, and I knew we were within a half hour of the finish. The lakes were sparkling in the late afternoon light, and I couldn’t help but wonder who would go for the Wet Waldo. I racked my brain for landmarks that were familiar from running this section on the way out eleven hours earlier, thinking the finish will be around the next corner okay the next. Finally we popped out on the long straight away with the finish line banner and a small crowd of people waiting at the end. We made a final push to cross the finish line, smiling all the way. I plopped down in the gravel just past the finish line, and was offered an icy cold bottle of water and my choice from a rainbow of hats. A huge BBQ spread was in full swing, and massage therapist, Kelly, offered me and my dirty legs a massage. They know how to treat runners at Waldo! Lewis Taylor, the Find Waldo winner and 1st place male, finished in 11:26, only 18 minutes off the men’s course record time. Megan Arbogast finished second female, first masters in 12:34, only 20 minutes off her master’s record set the year before. Craig Thornley won the men’s masters in 12:48. A couple of brave souls jumped in all six lakes for the Wet Waldo award, but the first to cross the line and therefore win the prize was Beth Epstein, from Long Beach California, who completed the relay with teammate Kim Gimenez in 13:41. It was a long, tough, and beautiful day on those 66.3 miles of Waldo. 47 of the 67 solo starters and 17 relay teams finished the race. I can’t imagine I was the only racer searching for the finish line in those last miles and perhaps thinking, if it were really 100 km we would be done by now. But then again I think most would agree there was not a single climb, descent, or winding section of trail that I could see missing out on.